“We are what we eat” is the familiar yet disquieting phrase introducing Foam Amsterdam’s latest show Feast for the Eyes. Featuring photographs from across artistic and commercial practices, the exhibition questions our diets as a hinge-point for expressing identity, personal beliefs and status. The show is categorised into three dynamic themes – much like the three meals associated with modern day dining – the first of which is still life photography. Through compelling, aesthetically pleasing arrangements, meals are presented as objects that provide us with deeper concepts about the way we live. In this category, Paul Strand’s Pears and Bowls (1916) is a seminal work; the silver-platinum print immortalizes the everyday through a neat, almost claustrophobic composition that moves fruit and crockery into the realm of constructivist subject matter. The second strand is entitled Around the Table – providing a journey to discovering the human connections made through sustenance. 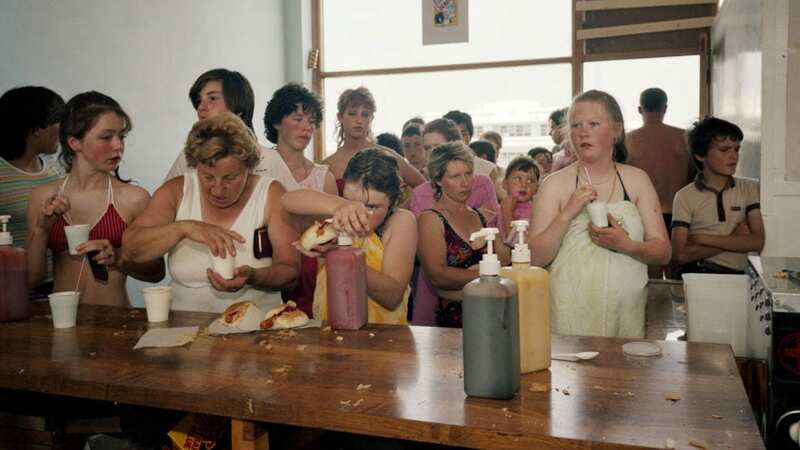 Martin Parr is a notable example within this section, depicting as he does a unique sense of Britishness and community over the counters of chip shops and beach landscapes. Through capturing the utterly ordinary, Parr builds upon the ideas the food – and indeed our experience of it as a collective nation – says something about our identity beyond class cultures. This theme is again picked up in Stephen Shore’s recognisable depictions of 1960s America with its fast food and motels. The final strand – labelled Playing with Food – is perhaps the most experimental and compelling. In one work, the Mona Lisa is rendered through peanut butter and jelly by Vik Muniz. Audiences are invited to question their physical and bodily desires around the staging of food – intersecting a sense of cultural complexity and base-level urges. A distinct feature in the show also comes through the presentation of archival cookbooks – portals into a world gone by and traditions that have left us for a globalised, homogenised culture. The selection is varied, and covers both geographical and technical terrains. As viewers flip through the pages of the books, they are dazzled by the colour reproduction and advertisement techniques that continued to evolve from one generation to another. Ultimately the show provides a platform to interrogate our relationship with what we eat; photography being a mediator for examining, on many levels, that which we carry with us throughout our lives. Based on the assumption that the senses are a leading factor in the formation of our memories, our consciousness, and our connections to other people, this show is a poignant and necessary reflection on the quotidian in art. Feast for the Eyes runs at Foam Amsterdam until 3 March. For more information: www.foam.org. Championing new artistic voices is increasingly important. The Foam Paul Huf Award celebrates emerging talent within the photographic realm.